This excellent biography has been kindly shared by its author, Julian Yeo who has been researching the family for many years. These delightful photographs were sent to me by John Pyne, a descendant of Alice Nellie Yeo, daughter of Isaac and Harriet. 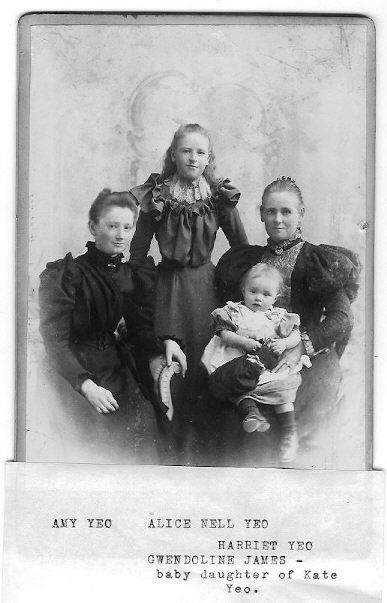 Photographs are unique, at the time of them being taken there were no photocopying facilities and probably only one member of the family possessed the original, usually the females. Isaac and Harriet with family. Can anyone identify these children or in laws? Isaac was left property in Weston Super Mare by his Uncle Isaac in 1868.
with wife Harriet and children, George, Nelly, Kate, Walter and John. Daughter Amy is with her grandfather George Palmer. In 1891 Isaac and Harriet were living with children, Amy, John, Nellie and William. 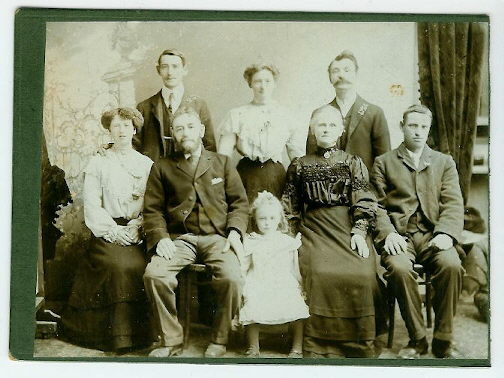 William and Nellie were born in Canada so between 1881 and 1891 Isaac and Harriet must have lived in Canada. In 1901 Isaac and Harriet were still in Weston Super Mare, with children William, a dairyman's porter and Nellie a draper's assistant. Children of Isaac & Harriet were:- Isaac George , Ellen Harriet, Florence Kate, Henry Walter, Emily Beatrice, Amy, John Courtenay, William and Nellie. 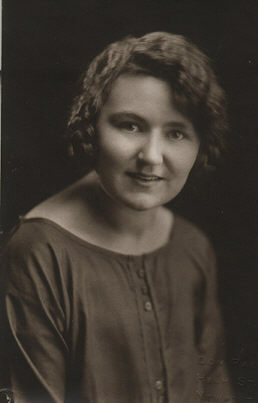 This is a photo of Olive Yeo, daughter of Isaac & Bessie Every . I believe she was about 18 at the time. I was the only child of Olive Yeo, and married Ernesto Renato Buzzi (deceased of Gallarate, Northern Italy) and we had two children Marc Richard Buzzi (15 April, 1965,Cheltenham Glos) and Lisa Caroline Buzzi (07 Jan, 1970, Montreal Canada). Marco (as he is known) is married to Shauneen Cousineau and they have two children Liam Renato Buzzi (5-May-1998, born Vancouver Canada), and Kayle Sebastian Buzzi (11-May-2000 born Victoria Canada). I was born in Gloucester UK on 8 October, 1941. Lisa is still single with no children .I emigrated to Australia in 1962 on the ten pound scheme. This being that one had to stay in Australia for two years before leaving otherwise reimburse the Government for the fare over. I was working my way around Australia and arrived in Alice Springs where I met Tino (Ernesto Buzzi), we spent some time together and then I left for a three day train trip down to Melbourne, never expecting to see him again. When I arrived at the station in Melbourne there he was. He had taken a flight down. That was in 1963. In the autumn of 1964 we left by ship from Melbourne to Naples, and we spent a month in north Italy before journeying on to England where our son Marco (Marc) was born. We then moved on to Canada and resided in Montreal until after the birth of our daughter Lisa. We then went to Auckland, New Zealand for a few years before returning to Montreal in 1973. Many years ago I was in contact with a Mr Alan Cookson, who I think has now died. He did alot of research on the John Yeo & Martha Wood branch that moved to the Liverpool area in the late 1800's and then emigrated to America. At the time he was convinced they descended from the St Giles Yeos and this research is on the internet. Recently I discovered he was in fact a descendant of John Yeo and Mary Banbury. One clue we completely missed was John & Martha naming their first daughter as Mary Banbury Yeo. This is the correct tree.